Kaitlyn Dundorf, a freshman at Hillsborough High School in New Jersey, visited a local chapter of the Sisterhood of the Salaam Shalom as part of an assignment for her Exploring Journalism class. The assignment required her to write a feature story, highlighting a local event or organization. She was interested to find out more about SOSS, so she attended a meeting hosted by Adla Karim. One ordinary Thursday evening, a family huddles together in a warm home as they chat about their lives, each lending understanding and support for their fellow sister. As many sisters do, these women trust one another and are able to share their stories as they further develop the bonds that have connected them all their lives. However, what if you were told the bond that connects these sisters is not blood? What if you were told these sisters are members of two religions known and stereotyped often for vicious conflict between them? They are a family of sisters that in many people’s eyes, could not be more different, yet they sit beside one another in peace, breaking down the walls of stereotypes that plagues not only the media, but the homes of thousands of Americans throughout the country. This group of women represents one sector of an organization called The Sisterhood of Salaam Shalom®. The nonprofit organization was developed in 2010 as a way to bring together Muslim and Jewish women in order to foster understanding between the groups, build relationships of trust and respect, and to fight hate by building bridges and supporting one another. As written in a letter from the Executive Director, Sheryl Olitzky, what started as a simple outlet to stop hate and combat negative stereotypes, “blossomed into a real sisterhood that shares in public advocacy, participates in life cycle events and holiday celebrations, and has regular get-togethers.” The organization currently has 150 chapters and is working with women to establish new chapters throughout the United States and Canada. On March 23, 2017 a new chapter was established in Hillsborough, New Jersey. 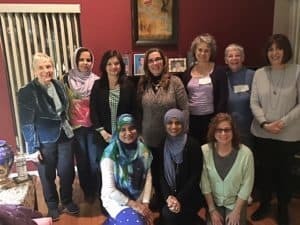 As the day melted into evening, Muslim and Jewish women alike came together for an introductory meeting at the home of Adla Karim, a Hillsborough resident and follower of the Islamic faith. “The dialogue between Muslim and Jewish women and the similarities we have, intrigued me to come,” said Saba Rahman, one of the women who attended the first interest meeting at the Hillsborough sector, “I think it will be very valuable because it will increase the dialogue and understanding between the two religions from a woman’s perspective. I am here to find out more.” While it was clear these women were connected by their similar desire to discover more about the organization, as the night progressed, intrigue and near amazement illuminated the faces of many of the women as the dialogue between one another revealed striking, unknown similarities. One member, Pamela Sloan, said before the meeting began, “I think this would be a wonderful and loving environment to promote understanding about each other, our different cultures, and just to learn.” The women did just that as they sat together in a circle listening and asking questions as introductions grew into in depth descriptions of cultural and religious practices. The room jostled with questions and moments of enlightenment as scattered voice proclaimed statements of surprise at just how similar they all were. The group hopes to bring together specifically Muslim and Jewish women because as described by Karim, “Throughout recent history there has been conflict throughout the middle east between Jews and Muslims so this has put out a bigger conflict in the global environment. Also, both groups are minorities and are more targeted than any other groups right now, so we hope to come together to have a better understanding of the culture, tradition, and religious differences to break stereotypes and lend support where it’s needed for the other group.” In the future, the group plans to expand their influence to other women and to find out what is going on in the community that needs their support. As Olitzky said, “It is easy to hate someone you do not know. But when when you know them, it’s hard. And when you love them and care about them, it’s nearly impossible.” As such, The Sisterhood of Salaam Shalom® is founded on the idea of women standing beside one another in support to teach others that we are not so different. The group hopes to influence others starting with one Muslim and Jewish women at a time in the hopes that the love and relationships created will influence other people’s perspectives as well. Therefore, what may begin as a collection of hesitant new faces joining together for a single meeting, can be transformed into a family of sisters who prove love and understanding can overcome hate and prejudice. As seen by countless chapters of The Sisterhood of Salaam Shalom®, despite differences in cultural backgrounds, sisters do not have to be bonded by blood, but instead they can be connected by love and support to stand beside one another in strength. Great article. Women can be the start of world peace.